Zenity and KDialog let you integrate your scripts with the native KDE or Gnome environment. A full-blown GUI-based application is beautiful to behold, but a graphical interface is way more trouble to create than a simple shell script. If you like the simplicity of scripting, but you prefer a little more visual feedback, Zenity (for Gnome environments) and KDialog (for KDE) are a pair of tools you should know about. These handy helpers let you integrate graphic dialog boxes into your scripts. Dialog boxes prompt users for input, display output, or just report progress on a process. Zenity and KDialog also output error messages and general status information in the form of visual feedback, and you'll never need to type pathnames painstakingly; instead, you can use a graphical file browser. Zenity  is included by default with the Gnome desktop in openSUSE, Ubuntu, and several other distros. 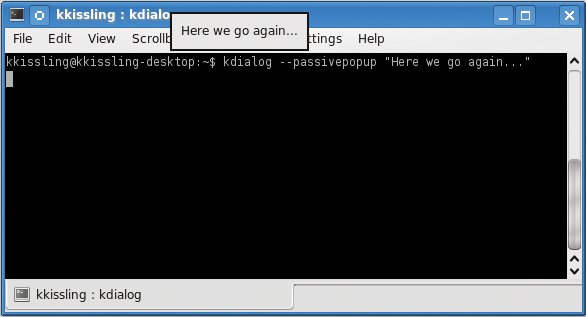 KDialog is often installed with the default KDE environment. If your distribution does not include these tools, install the kde4-dialog or zenity package to get started. If you write scripts for other people, the computers that run those scripts will also need Zenity or KDialog. It is a good idea to incorporate a test into your script that checks for the presence of Zenity or KDialog before invoking their commands. The simple Shell script in Listing 1 is a good place to start. If you save the script as zenity, type chmod u+x zenity to make it executable, and then type ./zenity to launch, you should see a slider control as in Figure 1. Because the dialog box does not have a name and the text for the slider is missing, Zenity uses standard labels. Figure 1: A slider lets users generate numbers graphically. 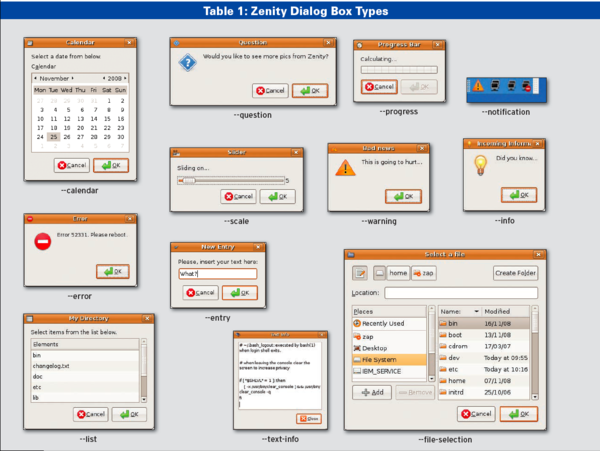 Table 1 shows the different Zenity dialog box types. The parameters that Zenity uses to call them are on the left with a picture of the dialog box next to it. As you can see, the selection includes input fields. Bash reads these fields when you click OK; the --entry field is an example of this. To pass a numeric value to Bash, use the slider (--scale). The --list control lists information and supports sorting if you click a field name. A progress indicator is useful wherever you need to monitor progress; for example, you could use one to show the progress of a search. But I'll look at the basics first. To label a window, you generally want to use the --title keyword. Listing 2 shows how to let the user select a value between 1 (--min-value=1) and 10 (--max-value=10) and assign a default of 5 (--value=5). This gives you a dialog like that shown in Figure 1.
ls | zenity --list --column "Show Directory"
lists the files in a directory and sorts them alphabetically when you click Show Directory (Figure 2). 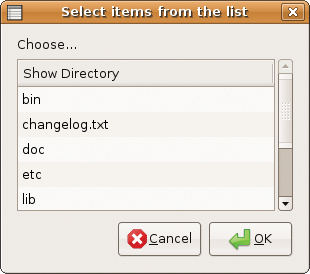 Figure 2: Click Show Directory to list the files. Although Zenity will build interesting graphical menus for you, it does not take the task of designing program logic off your hands. Therefore, you need an If condition to tell the script what to do when you click Yes or No. In general, Zenity and KDialog define two internal return values for dialog boxes: A positive result (Yes) returns 0 and a negative result (No) returns 1. 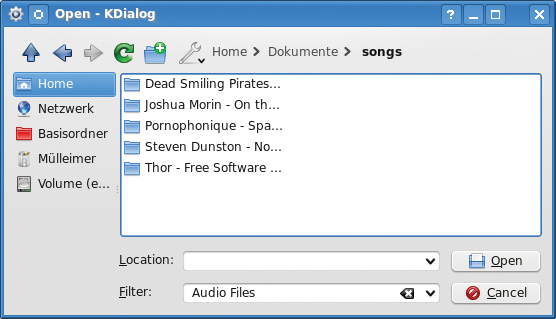 A third result – such as Cancel from KDialog – would return 2. You can create conditional statements by querying these return values. kdialog --yesno "Do you really want to remove this file?" kdialog --title "Yes or No"
--yesno "Do you really want to remove this file?" In contrast to Zenity, KDialog complains if you just type kdialog --yesno without adding text – the program does not generate default labels. Figure 3: KDialog will quickly set up a Yes/No dialog. If you enter text in a field, it is typically displayed on the console, which is the standard output device, but you also can pipe the output into a file – for example, file1.txt (Listing 3, line 1). Alternatively, you can pass the results to a variable (Listing 3, lines 2 and 3). In addition to the messages mentioned here, the --dontagain switch makes sure that KDialog does not continually repeat a question. This displays a Do not show this message again checkbox on top of the Yes/No dialog. kdialog --dontagain rememberfile:decision --yesno "Do you really want to delete this file?" In this case, the script would autorespond Yes whenever this question is posed. KDialog dialog boxes typically have a couple more switches that I'll look at. If you get stuck, man kdialog and the overview in the KDialog manual  will help you with the details. The --passivepopup option lets you display a short message to users. It pops up a bubble in a dialog and tells the user something (Figure 4). A number following the pop-up text specifies how long you want the text to display (this is set to five seconds in line 1 of Listing 4). A /n sequence adds a line break to the dialog box text to keep it from spreading all over the screen. Figure 4: The --passivepopup option lets you display a short message so that the user sees the pop-up without losing the current focus. If you want to select a specific file on disk, it makes sense to use the --getopenfilename option to do so. This returns an absolute pathname, such as /home/user/song.mp3. Another very similar parameter, --getopenurl, returns a URL, as in file:/home/user/song.mp3. For example, you can use this approach to open FTP addresses. Their counterparts that save files are --getsavefilename and --getsaveurl. To open only specific file types – such as MP3-formatted tracks – just add a descriptor to the command (Listing 4, line 2). KDialog shows the MP3 files entry as a Filter (see Figure 5); if you delete the pipe and the entry, you see the file suffix instead. Figure 5: If you want the script to work on audio files only, you should restrict the user's selection options. After --getopenfilename, you normally pass in the path the dialog box opens – in this example, it was the current working directory. If you replace this entry with :label1, the file manager will start where you left it last time; that is, it remembers the last directory you used. If you author scripts for other users, dialog boxes give them useful visual feedback – especially if they are newcomers. Finally, a word of warning: Don't be surprised if you find yourself re-writing working scripts and get so used to the convenience that you don't want to do without the reassurance of visual feedback. Starting a script on a Linux server with just a few mouse clicks sounds more complicated than it really is. If you want to create attractive and interactive dialogs for your desktop users, all you need is a small utility called SSH and a little Bash know-how. Some shell scripts are silent; others communicate to users extensively. Learn how to make their dialog smoother with, er … , dialogs. As someone who writes about Linux and open source software for a living, I have tools and tricks that are essential for my daily computing. In this installment of the Workspace feature, I share my personal favorites with you.